We’ve just received tour dates for the October/November Deep Purple tour of Germany. These are preliminary dates, they come from the site of promoter Klaus Bönisch, and at this point are very unconfirmed and subject to change. 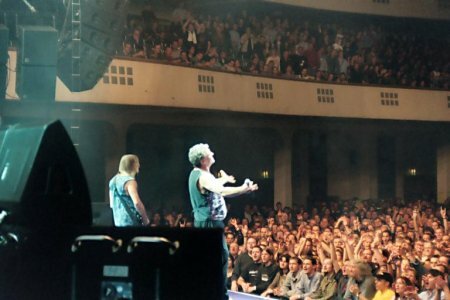 Deep Purple have never been strangers in Germany and tour there almost every year. The country was skipped in the 2007 schedule, but it looks like promoters and the band are making up for it this year with two tours — one in the summer and one in the fall. Thanks to Akiko Hada for the info. Posted by Nick Soveiko on Friday, February 22nd, 2008, filed under News. You can follow comment on this post through the RSS 2.0 feed. You can leave a comment below, or trackback from your own site. Well, can we expect a new album around that time too? Why doesn’t they work at solo projects or so? or why doesn’t they record another studio album? DP will continue touring untill Gillan will not have a voice at all, untill Morse will forget Smoke riff and until Paice will not have any strength in his hands??? No time to record a new album? A shame. Will they come again with their “greatest hits” setlist and no new songs? Phew.